You may not know this, but a lot of pain and inflammation (soreness and/or swelling) can be worsened or even caused by the foods we eat. Some foods turn on the body’s response to injury or nerve damage and increase the pain we feel. Other foods serve as fuel (think of throwing gasoline on a smoldering fire) for the body’s natural repairing systems and cause an overreaction to a painful condition. People with rheumatic and autoimmune diseases (think rheumatoid arthritis, Crohn’s disease) can really make their condition worse when they eat these foods. There’s also evidence that people who suffer chronic neck and back pain can improve their pain sensation if they avoid these triggering foods. While it can be difficult to avoid everything involved in the food-inflammation connection, it may be helpful to try reducing and eventually eliminating foods that are both harmful for your health as well as tend to make your chronic pain worse. 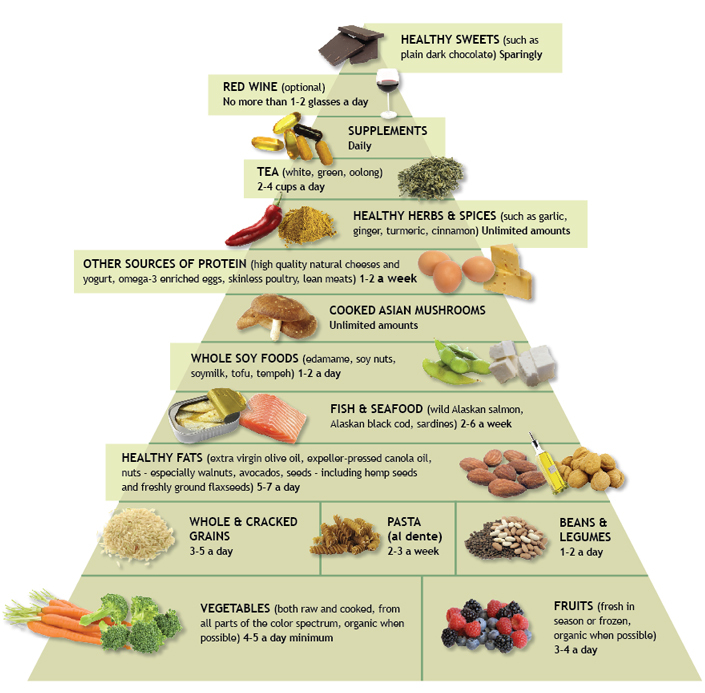 Foods to eat- everyone would benefit by following the general guidelines illustrated in the food pyramid Dr. Andrew Weil has developed for his website. Another diet shown to improve health and pain is the Mediterranean diet, found described at: https://oldwayspt.org/traditional-diets/mediterranean-diet Fresh or frozen vegetables and fruits serve as the base both these healthy diets and should comprise almost 40-45% by volume the amount of food eaten daily. Whole grains (think brown rice, quinoa, cracked wheat) and legumes/beans (think chickpeas, lentils, pinto and black beans) which should be cooked out the bag, not canned as there is usually way too much salt that companies use a cheap substitute for flavor. Add spices such as turmeric, cinnamon, basil, etc. to boost the anti-oxidant and anti-inflammatory effects when cooking. Limit the amount of fats and focus on oils derived from nuts, seeds and fruits such as extra-virgin olive oil, canola oil, ground flaxseeds, walnuts, and almonds. Oily ocean fish such as wild salmon, black cod only 2-4 times per week and in small portions (about the size of a deck of cards). Some nutritionists advocate avoiding red meat and dairy altogether. This article won’t fully explain all the components of the pyramid but we hope you research this on your own and make the effort to improve the quality of the foods you eat. Many patients report a huge difference in the way they feel once they begin getting the foods our bodies were meant to eat and the vitamins and other compounds that they contain. Think of good food as medicine that also tastes great. We all know what sugar is. White or brown, powdered or granular, without any redeeming qualities other than how our mind craves it- sugar has negative effects on so many body systems it should be kept to an absolute minimum or better, none at all. A sneaky villain is a sweetener derived from corn, that goes by the names high-fructose corn syrup or corn syrup, etc. but there are other sources of sugar lurk in processed foods and go by the names lactose, maltose, sucrose, dextrose. Sugar-sweetened sodas and beverages such as sweetened iced tea can have massive amounts of sugar. (A can of soda has up to 9, that’s NINE teaspoons of sugar in it!) There is no place for soda in a healthy diet as it provides no useful nutritional building blocks. Even fruit juices lack the beneficial fiber which is removed for the sake of making it more tempting (even the best quality ”high-pulp” juices have only a tiny amount of the fiber your body needs). And SURPRISE! There is also lots of hidden sugar in many foods such as ketchup, spaghetti sauce, jams and jelly, peanut butter, the list goes on and on. Odds are, if a big food company made it and put it in a box or a bottle, it has something like high fructose corn syrup or sugar, modified food starch, and other sweetening or thickening agents. Some processed foods simply release natural sugar or starches too fast because grinding/milling (think flour) allows your body to absorb them faster than it can handle. Think snack crackers, potato chips, boxed cereal (even fancy granola), breads/rolls, tortillas, pasta, and other foods made from a grain. Remember, just because something is derived from Nature or is “natural” and even organic doesn’t mean it’s healthy for you. Learning how to recognize and avoid processed foods would be helpful as you change your diet, but the easiest way to do this is to just eat whole foods. The nightshade family of vegetables (potatoes, tomatoes, pepper, eggplant) have been branded as being pro-inflammatory but this is controversial and not supported by science. Potato chips and french fries are however unhealthy and should be avoided. If you are willing to try a diet free of selected foods, it may be helpful to see if you get any benefit. In the meantime, tomato sauces and salsa without sugar, peppers roasted, stir fried, or raw in salads and baked potato (with little to no sour cream/butter) are fine.